Canadian Xpress Mighty Bloom Enhancer quenches the craving that plants have for potassium when they are in the flowering stage. This product consists of the highest quality ingredients and delivers much needed potassium to contribute to high yields and impressive weight of crops once produced. Once a plant reaches its flowering stage, the need for potassium grows intensely. The additional potassium supplied by this product encourages the rapid rate of development and growth in plants ensuring that it doesn’t lack the nutrients necessary for flowering. Canadian Xpress Mighty Bloom Enhancer contains quality ingredients that are effective in the improvement or enhancement of the yield produced by crops or plants. Today’s technological approach to quality production of crops requires refined products such as this one. 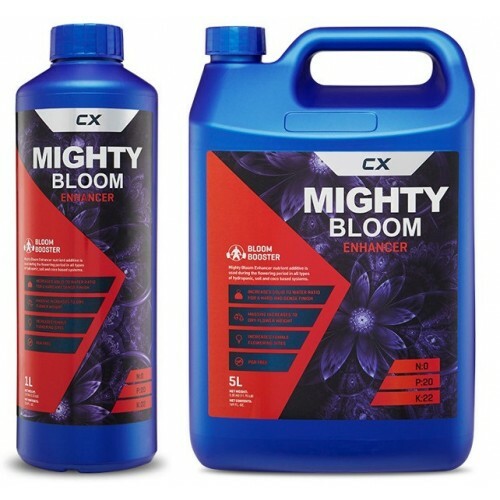 Canadian Xpress Mighty Bloom Enhancer was formulated explicitly to increase the potential of the yield of your crops. It provides the essentials that plants and flowers need to flourish and gain weight. The enhancer inspires more female flowering spots, heftier fruit and also functions as a hardener. The utilization of Canadian Xpress Mighty Bloom Enhancer alerts your plants that it’s time to transform all prior growth and vitality storage into bud weight. Once the signal is sent and received, a natural procedure of transferring stored minerals and carbohydrates to be utilized by swift growing flower buds. This provides them with the ultimate nourishment and size. Canadian Xpress Mighty Bloom Enhancer should be utilized from the beginning phase of flowering up until the flush. Remember to shake the container well prior to each use. Mix the solution of nutrients as always and mix-in Mighty Bloom Enhancer at a proportion of 1ml per Litre. Adjust levels of pH as needed. Remember to never mix enhancers, additives or nutrients together in their resolute form or directly from their container. Be sure to mix-in each additive, nutrient, booster or enhancer to the water or feed-solution water. Finally, stir consistently to mix well prior to adding the next additive. If your desire is to motivate your crop to continue or start producing abundant floral collections during the budding phase, it is essential to give your plants the proper blend and amounts of potassium bloom boosters such as Canadian Xpress Mighty Bloom Enhancer. When flowering, plants and flowers may exhaust potassium and other important elements in the rhizosphere somewhat rapidly. In some cases this takes place in less than 74 to 95 hours. Potassium exists in the most extreme quantities and acts as a catalyst for the proper function of most flowers and plants. It aides in the formulation of vital stems, vibrant colour, provision of necessary thickeners and oils, and decreases the need for water. It is vital for the division of cells and stabilizes the properties of additional calcium and nitrogen. When rapidly growing or producing plants or flowers fail to obtain the amounts they require, sugar production is stunted and plants will find it challenging to conserve the necessary energy for the development of heavy buds and flowers. Growth of plants is strained and the quality of the production is negatively impacted. To achieve a high-quality and beautiful harvest, Canadian Xpress Mighty Bloom Booster with needed potassium is a great benefit. Plants benefit best from Canadian Xpress Mighty Bloom Enhancer during the week that flowers or fruits are set. This occurs in the third phase of the flowering stage. Henceforth, an additional dose of potassium should only be fed to the plants for a single week, which should be three or four weeks prior to harvest. Following this period, plants or flowers don’t induce as much phosphate. If the plants are continuously fed additional bloom additives to motivate longer flowering, the plant won’t absorb them, but will accrue in the growing standard, which will proliferate the EC. Less is more! Many growers will assume that if recommended amount is 5ml then 10 ml will be more efficient. This is not the case. For plant nourishment, proper balance of nutrients is efficient. Therefore, the plant should only be rendered what it needs, when it needs it. Although some strains of plants benefit from additional dosages of potassium at the highpoint of the generative stage, you don’t want to overdose them. The objective is to increase the plant substrate’s potassium. Going overboard or giving the plant’s too much could lead to a major nutrient deficiency that could cause the yield to produce less than normal or expected. Always exercise precaution during booster application. Don’t hastily add random boosters in hopes of improving or motivating the flowering process. The use of excessive additives is a common cause of nutrient discrepancies in an indoor hydroponic garden. Boosters won’t perform magic but with the proper application technique, the results can be miraculous. The ingredients found in Canadian Xpress Mighty Bloom Enhancer help to multiply flowering spots per stem when applied during the blooming stage. This causes the internal fabrication of metabolites to accelerate, which maximizes the sites at which budding occurs and stimulates inexhaustible flowering and substantial blooms. Canadian Xpress Mighty Bloom Enhancer is designed to develop heavier, larger blossoms that result in a full-bodied crops that are filled with radiant buds. Growers find it easier to accommodate a quality growth cycle with the use of this bloom enhancer. In addition to yielding phenomenal crops, this bloom enhancer provides prime essential oils and saves growers massive amounts of money. Canadian Xpress Regen-A-RootCanadian Xpress Regen-A-Root is a hormone free root growth tonic that en..
Canadian Xpress Mighty Growth Enhancer Canadian Xpress Mighty Growth Enhancer contains three diifere..